Union Minister of Food Processing Industries, Harsimrat Kaur Badal on Tuesday launched a scathing attack on Congress leader Navjot Singh Sidhu over his claims that Pakistan is willing to open the Kartarpur Sahib corridor. 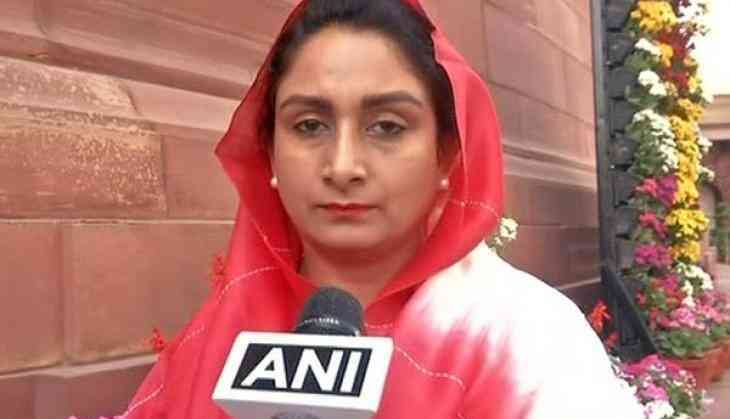 Harsimrat's comments come in the wake of External Affairs Minister (EAM) Sushma Swaraj issuing a clarification earlier on Tuesday, saying that there has been no official communication from the Pakistani government for establishing the corridor that would enable Indian pilgrims to visit Sikh's holy shrine Kartarpur Sahib in Pakistan under a bilateral protocol. Congress leader Navjot Singh Sidhu, on his return from Pakistan last month, had claimed that Islamabad will open the corridor of Kartarpur Sahib on the occasion of 550th birth anniversary of Guru Nanak, which will be celebrated next year. Addressing a press conference here, Harsimrat took on the cricketer-turned-politician and said, "This minister from the Punjab government (Sidhu) betrayed the lakhs of soldiers deployed on the borders by hugging Pakistani General Bajwa. He kept his friendship above the country. Our people were outraged by his actions, when he returned, he was shown black flags, and everyone was angry that he went there and hugged someone who kills our people." Siddhu's visit to Pakistan drew criticism from some quarters in India after he hugged the Pakistani Army Chief, General Qamar Javed Bajwa at the swearing-in ceremony of Imran Khan. "Instead of apologising, he played with the people's sentiments. He said that he hugged the General as he was assured that the Kartarpur corridor will be opened," the Shiromani Akali Dal leader added. Harsimrat further stated that while his claims calmed the storm he was facing, there was no evidence to substantiate them. "His claims brought huge relief to the Sikh community as this has been an age-old demand. Everyone forgot that he went to an enemy nation. However, weeks passed, and the Congress minister couldn't produce any documents, just talks," Harsimrat said. Harsimrat informed that she had written to the EAM, urging her to take up the matter with the Pakistan government if they are willing to agree to the demands. "Sushma Swaraj Ji wrote back to me saying that no Pakistani government has communicated anything on the matter. There is a protocol from 1974 which allows pilgrims to visit the gurudwara, but they haven't even agreed to that," Harsimrat said. She also aimed a potshot at Congress president Rahul Gandhi, saying, "Were his (Sidhu's) actions sanctioned by you? Did you permit him to go to an enemy nation, hug the general, come back and play with the people's sentiments? Will you take any actions against him?" The Kartarpur route along the India-Pakistan border is around three kilometres away from Gurdaspur in Punjab, and if opened, will give Indian Sikh pilgrims direct access to the historic Gurdwara Darbar Sahib in Kartarpur in Pakistan, where Guru Nanak breathed his last in 1539.